Legal marketing is a tough business. Aside from being one of the most competitive industries, you can often have a battle on your hands when it comes to convincing the partners to invest seriously in digital marketing. There’s added pressure to get results fast and prove your approach is working – we know this because we’ve worked with many law firms over the years and those first few months can be difficult. 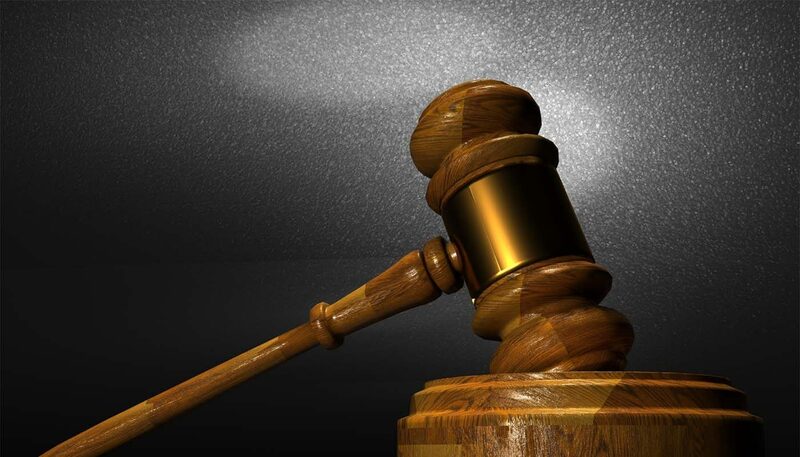 So today we’re going to take a look at four legal marketing challenges and how to overcome them. 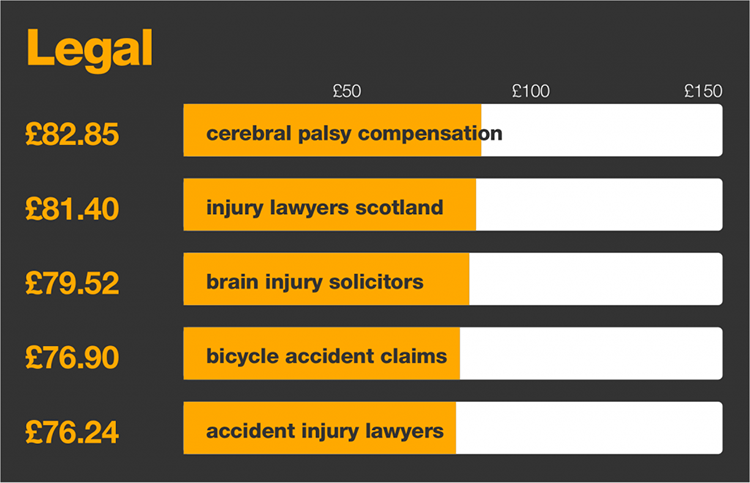 Legal search terms are among the most expensive keywords in the UK for AdWords advertisers. Figures from SEMrush in 2016 suggests legal marketers are paying up to £82.85 for a single click, but it’s not all bad news. Generally speaking, law firms make more profit from each client than your average eCommerce retailer. The price of paid traffic might be higher than average, but your AdWords ROI should be considerably higher than most industries. Even still, you want to pay the lowest price you can for each click without reducing the quality of leads they generate. Target specific user intents: Avoid generic search terms and focus on specific needs – this will reduce the cost of your keywords and increase the quality of your leads. Find long-tail keywords: These are less competitive and they’ll be more relevant to the specific user intents you’re targeting. Target locations: Competition and price will automatically drop when you target by location. Increase Quality Score: The higher your AdWords Quality Score, the less you pay for each click. Prioritise CTRs: Likewise, the higher your click-through rates are, the better your Quality Score will become. Plus, you’re also generating a higher number of leads. Experiment with ad positions: Lower ad positions don’t always mean worse performance, but they do cost less. All of the above will help you reduce CPCs without hurting the quality of your leads, but the most important thing is to manage your bids correctly. You’ll find your ads perform better at certain times of the day, days of the week and months of the year. Which means upping your bids on keywords at the opportune moment can seriously lift your AdWords profit. Not only that, but dropping your bids when performance is likely to drop will reduce your overall spend on keywords and improve your campaign performance even further (CTRs, Quality Score, etc). The problem with managing bids this way is it takes constant monitoring and adjustment. We use machine learning and predictive analytics to spot trends and adjust bids accordingly, allowing us to really squeeze the most out of AdWords budgets. 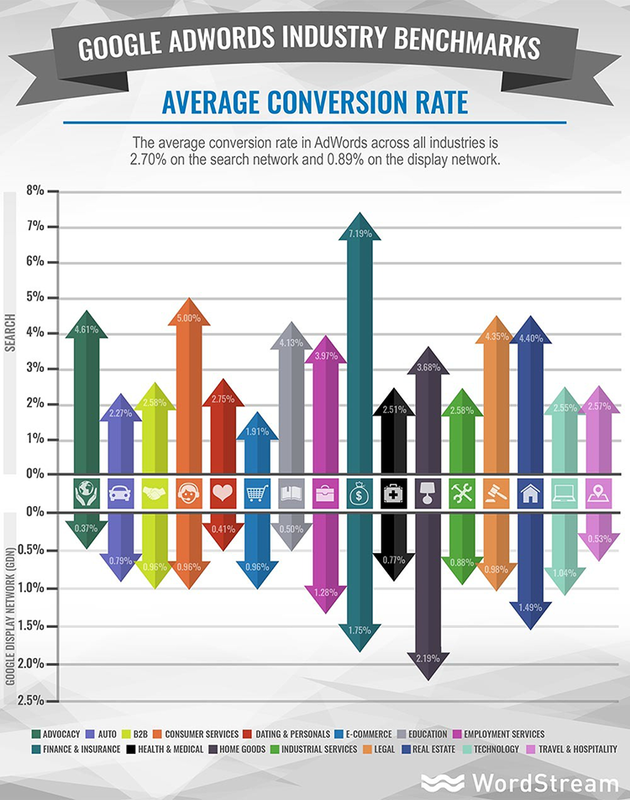 According to data from WordStream, the average conversion rate for legal websites is 4.35% – admittedly, this data comes from the US, but you should be aiming for above-average conversion rates as a legal marketer. The typical sales funnel for legal firms is shorter than many other industries. People are searching for legal advice because they really need it or think they might be eligible for compensation – high motivation in either case. So, for law firms specifically, the magic really needs to happen on your landing pages. Of course, you’ll also want strategies in place for visitors that don’t convert first time around (eg: remarketing). But the nature of leads in legal marketing isn’t the same as consumer leads who want to compare products and reviews, place stuff in their basket and then leave. Legal leads are more likely to take action right there so make landing page conversion rates a priority. Fighting for real estate space on Google can be particularly difficult for law firms. We’ve already addressed the issue of expensive keywords and that should give you a healthy boost against the competition, but you can go much further than that. With AdWords, the best way to make your ads stand out is with ad extensions. You have location extensions for people searching in your area, sitelink extensions to make your ads larger and provide more context, call/text extensions for mobile users to call/text right there and plenty more. Ad extensions not only make your ad stand out visually, they also encourage more users to click. You’ll also want to back up your paid advertising campaigns with SEO. For local campaigns, being present in the Google Maps feed reinforces your position and you also have the opportunity to rank in the organic listings as well. That’s as many as three places up for grabs on the same SERP for local searches (these are incredibly important). Finally, when you can’t take competitors on directly, find ways to beat them elsewhere. For example, your biggest rivals might bid more on certain keywords than you could ever match. But this doesn’t mean you can’t beat them with content marketing or paid social to attract leads from places they’re not looking at. Law professionals are used to connections and reputation doing the marketing for them. This is how it has been for hundreds of years and you’ll find many execs at law firms are sceptical about investing serious money into digital marketing. To get the partners on board you’ll need to stop talking like a marketer and explain things from their perspective. Focus on the KPIs that matter most to them: Cost-per-acquisition, ROI, profit, time to payback, etc. Essentially, you need to make it clear how much your marketing strategy is going to cost, how much profit it’s going to make and how long it’ll take. And then you need to be able to prove it’s working with accurate reports. The connections and reputation thing works both ways though. If you’ve got no history of getting results with legal firms, the partners are less likely to buy into your suggestions. Consider getting a legal marketing specialist on board or calling in an agency with a track record for marketing for law firms. The thing with legal marketing is it gets easier once you’re past those initial challenges. As soon as the partners start to see tangible results, the pressure should ease and you’ll be able to focus on doing your job. We touched on local SEO today and we’ll be back to cover that in more detail during our next post – so keep an eye out on social for updates. Need help with your search marketing? Give our experts a call on 023 9283 0281 or submit your details here and we’ll call you. Solicitors: Why don’t we appear in Google Maps?